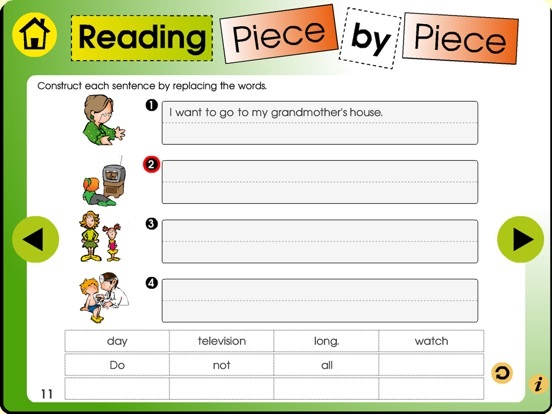 The Reading Piece by Piece game is an educational resource for Grade 3, 4 and 5 students. 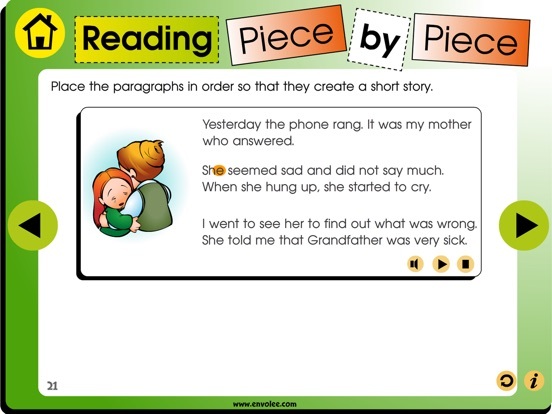 Thanks to this interactive application, your students will become better and better in English as they work on syllables, word order in the sentence and text meaning. 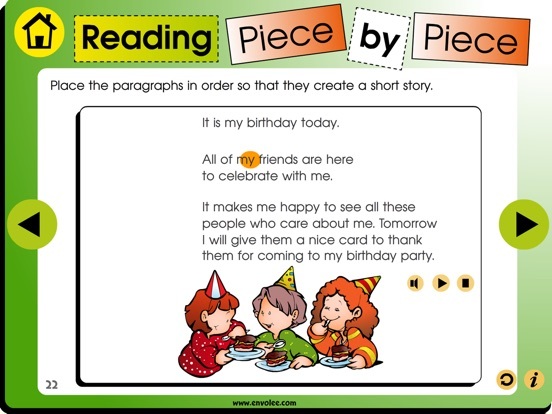 Directly taken from the book with the same name, the application is the ideal tool for having fun while making links and inferences. 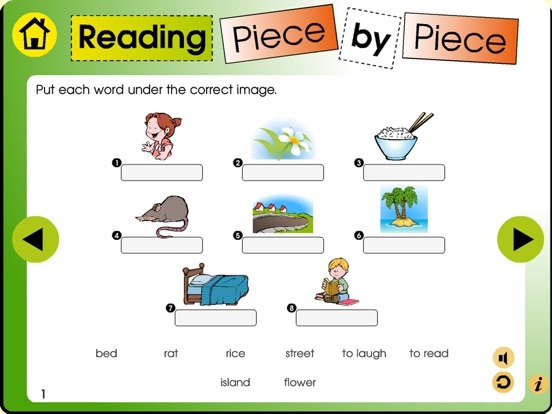 Easy to use, Reading Piece by Piece is created especially for children. 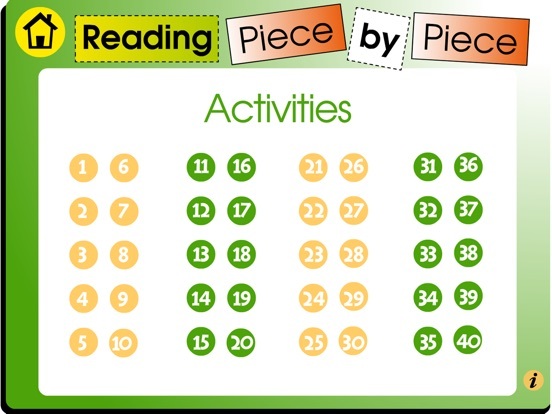 In the summary, a general view of all 40 exercises is visible for easier navigating. It can be accessed by pressing the home button. At the bottom left, the exercise number is indicated to keep track of where you are in the app. to create a text by placing sentences in the correct order. By touching a button in the right bottom corner, you can start over a same exercise. At Éditions de l'Envolée, we produce innovative edutainment applications for children that stimulate learning to read. We develop and publish educational applications for interactive whiteboards (IWB) and for tablets, as well as reproducible teaching materials for elementary and secondary students. We cover most subjects, including mathematics, French, English, Spanish, science, ethics and religious culture, social sciences, and others. 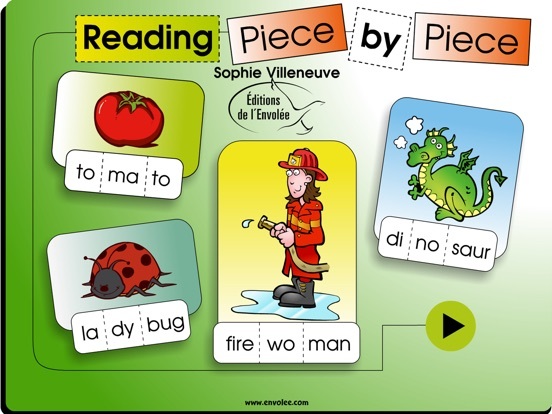 We also produce and publish literacy collections such as Du Plaisir à Lire, Être and Info Contes, which accompany children in learning how to read. © All rights reserved 2016. E-mail: service@envolee.com.